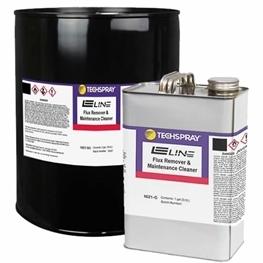 E-Line is a hydrocarbon-based cleaner formulated to be powerful, yet very economical. Eliminate brushing and scrubbing, saving time and materials. Clean oil and contaminants off of metal parts, printed circuit boards, barcode instruments, switch boxes, gear boxes, and engines. Maintenance cleaners clean oil and contaminants off of metal parts, printed circuit boards, barcode instruments, switch boxes, gear boxes, and engines. Techspray has produced Blue Shower® maintenance cleaners for over 30 years, making Blue Shower a staple in maintenance departments all over the world!